Military Photos and Photoshops: FC-1/JF-17 gets a new Pod ? FC-1/JF-17 gets a new Pod ? 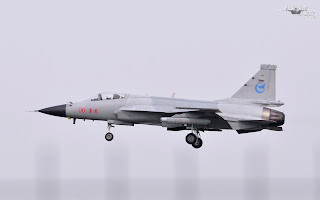 Recently fresh pics have surfaced showing the Jf-17 Prototype 06 at Chengdu Airforce base flying with a new pod. Many speculations have emerged so forth, some labeling it a new ECM pod like the KG-300 , some say its a new targeting pod similar to WMD-7, some have guessed it to be an IRST pod while other speculations sat that this is just a camera pod. The last explanation seems more plausible as this Jf-17 was seen as a chase plane for China new 5th Gen Stealth aircraft, the Chengdu J-20. So most likely it was just up in the air with a camera pod to monitor the flight of J-20 . Furthermore if you zoom in on the pod at the better resolution pic, i have posted , u will be able to guess the words written on the pod. From what i can make of it, it reads BFSK-01 . A quick search on Google reveals that BFSK and similar terms FSK, ASK etc refer to terminology in Telecommunication Physics. Frequency Shift Keying - Fast Frequency Hopping demodulator, which provides increased resilience to interference with a very slight complexity increase. The additional robustness against jamming is achieved by jointly observing the FSK demodulator branches. This allows the proposed demodulator to distinguish the jammer from the signal more accurately. This demodulator is particularly robust for the case of high J/S (Jammer to Signal Ratio), while for the case of low J/S its performance is in line with state-of-the-art receivers. This is also augumented by the fact that the pod in question had a UHF antenna popping out. This might give credence to the theory that the pod is actually a camera with secure frequency hopping , jam resistant radio communication device as the FC-1/JF-17 is being used as a chase plane for China's top secret Jet . But who knows, i may be wrong as this is just guess work as i am no expert.